Bad weather is believed to have played a factor in the light aircraft crash at Lanseria Airport, in which three people died, on Monday morning. 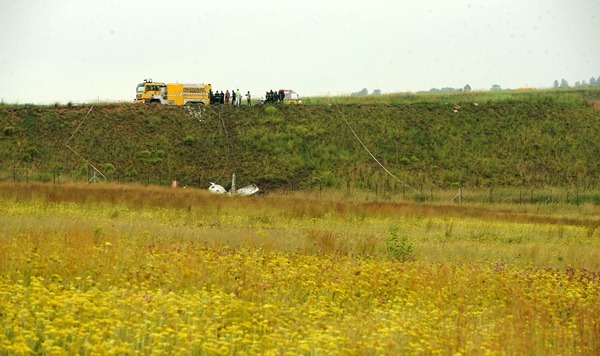 Bad weather is believed to have played a factor in the light aircraft crash at Lanseria Airport on Monday morning. "Speculation is that it was due to the weather," airport spokeswoman Claudette Vianello said on Monday. Three people died when a Beechcraft King Air BE90 crashed at the airport on landing. It was speculated that the crash on the embankment opposite the runway could have been due to the pilot trying to avoid hitting a building. "It is speculated that it was a controlled flight into terrain to avoid a worse collision with a building," she said. The SA Civil Aviation Authority and emergency services were at the crash site. The authority would investigate the crash, Vianello said. Various consulates had been calling the airport trying to determine if any of their people might have been on board. The names of the deceased have not yet been released.